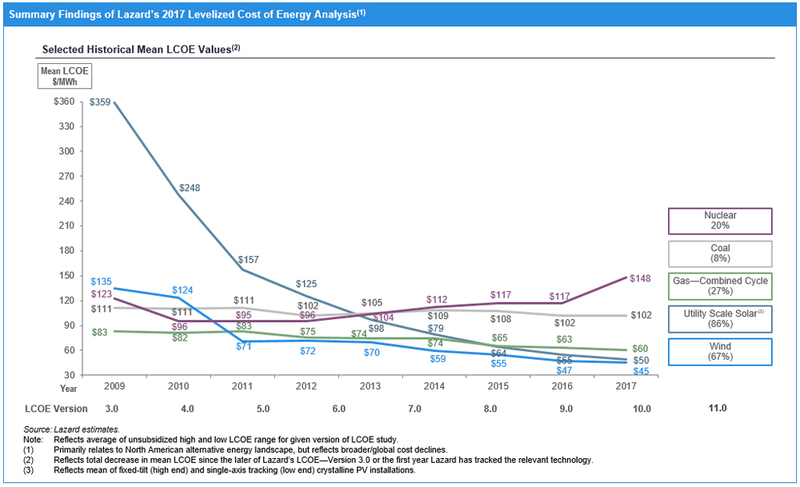 Lazard’s latest annual Levelized Cost of Energy Analysis (LCOE 11.0) shows a continued decline in the cost of generating electricity from alternative energy technologies, especially utility-scale solar and wind. Although alternative energy is increasingly cost-competitive and storage technology holds great promise, alternative energy systems alone will not be capable of meeting the base-load generation needs of a developed economy for the foreseeable future. Therefore, the optimal solution for many regions of the world is to use complementary conventional and alternative energy resources in a diversified generation fleet. The increasing economic advantage of renewables in the US has global implications, because in the US, conventional energy technologies are relatively cheaper to operate than in other developed economies. Given the higher costs of conventional energy sources in these other countries, the economics of alternative energy sources become even more attractive. Source: World Bank, IHS Waterborne LNG and Lazard estimates. (1) Low end assumes crystalline utility-scale solar with a fixed-tilt design. High end assumes rooftop C&I solar. Solar projects assume illustrative capacity factors of 26% – 30% for Australia, 26% – 30% for Brazil, 22% – 23% for India, 27% – 29% for South Africa, 16% – 18% for Japan and 13% – 16% for Northern Europe. Equity IRRs of 12% are assumed for Australia, Japan and Northern Europe and 18% for Brazil, India and South Africa; assumes cost of debt of 8% for Australia, Japan and Northern Europe, 14.5% for Brazil, 13% for India and 11.5% for South Africa. (2) Assumes natural gas prices of $4.00 for Australia, $8.00 for Brazil, $7.00 for India, $7.00 for South Africa, $7.00 for Japan and $6.00 for Northern Europe (all in U.S.$ per MMBtu). Assumes a capacity factor of 10%. (3) Diesel assumes high end capacity factor of 10% representing intermittent utilization and low end capacity factor of 95% representing baseload utilization, O&M cost of $30 per kW/year, heat rate of 9,500 – 10,000 Btu/kWh and total capital costs of $500 to $800 per kW of capacity. Assumes diesel prices of $3.60 for Australia, $2.90 for Brazil, $3.00 for India, $3.20 for South Africa, $3.50 for Japan and $4.80 for Northern Europe (all in U.S.$ per gallon).